When you are planning some serious fishing you can't just rely on a forecast made for landlubbers, you need an accurate marine forecast that will give you an idea of what to expect from those always changing North Carolina waters. 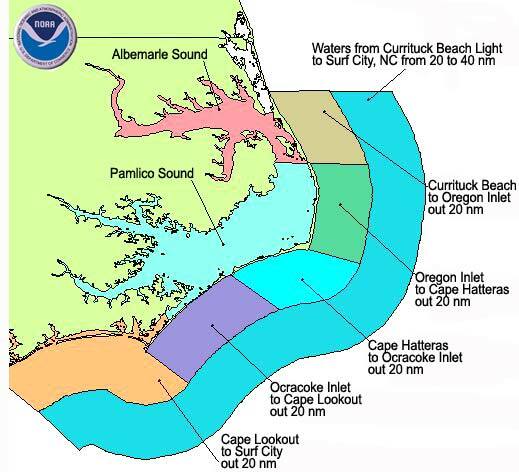 There are many websites and services that provide a current NC marine forecast, but it's hard to beat NOAA when it comes to a marine forecast you can count on. Everyone from fisherman to commercial shipping captains use and rely on these marine forecasts to safely navigate the NC waters, they are as good as it gets. If you are looking for the ultimate marine forecast tool, check out http://nowcoast.noaa.gov/. nowCOAST has sea surface temperatures, water current data, satellite imagery, wave data and everything else you could dream of. This is the first time this marine forecast data has been available for free. Below are links to several traditional NOAA marine forecast choices, but be sure to check out the new advanced graphical forecasts as well. If there are some times that you don't have access to the web or the VHF to get the most recent forecast but you really need to keep an eye on the weather, NOAA now also provides a mobile forecast for your cell phone or PDA. 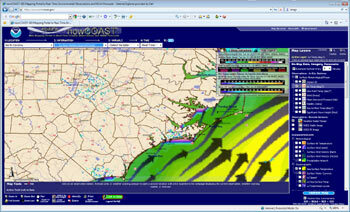 If you are interested in the mobile marine forecast, click here for more information. The following NC marine forecasts from NOAA are not only quick, easy, and straight to the point, they are also the most trusted. Just click on the map below and see the exact forecast you need. It's hard to beat the old standard, but NOAA has created these new graphical marine forecasts to present a ton of information in a hurry. Move your mouse over the times in the table on the left side and watch as the data on the chart updates.